Kiddo spends a lot of time in the kitchen. Not necessarily cooking, but he knows it's where to find me. If I'm not baking, I'm normally in the pantry grabbing a handful (or two) of chocolate chips straight from bag. The kitchen is also where kiddo learned the concept of trust. When he was about 4, I called him in to taste some chocolate sauce I had just made. He wouldn't try it. "It's really yummy...you'll love it," I said. Shakes head. "No...I don't want any." This went on for about 5 minutes...I could.not.let.it.go. He was going to eat the chocolate. "Sweetheart...Mommy will never tell you something is really yummy to trick you into eating it. Look, I'll never tell you broccoli is really yummy. I'll tell you that it tastes pretty good with some butter and salt, but it's never going to taste as good as a chocolate chip cookie. THIS, this chocolate sauce tastes as good as a chocolate chip cookie...trust me." Now you'll have to trust us. So, onto the recipe. I knew as soon as he peeked over my shoulder as I read cookies and cups, that this was going to be our first recipe... Chocolate Chip Cookie Dough Cheesecake Bars. 5 TBPS butter, room temp. 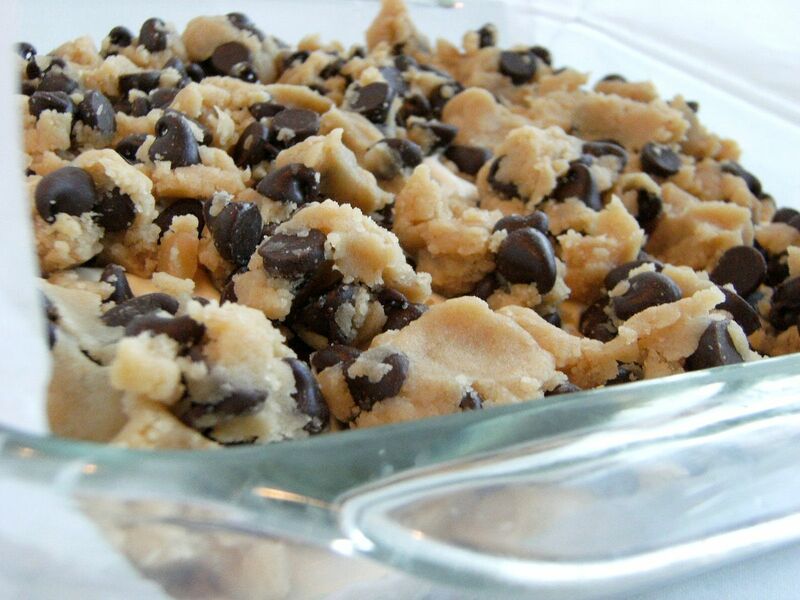 Combine the chocolate chips and shortening and melt in the microwave at 30 second intervals at 50% power. Stir after each interval; repeat until melted. Drizzle over the bars before serving. They were rich and delicious; I highly recommend serving them with sparkling water to wash them down! My only complaint, and I hate to complain about cookie dough and cheesecake, is that they are a little hard to cut into nice squares. These two in the pictures are the only pretty ones I got. The verdict: Kiddo gives these bars a thumbs-up! What do you love baking with your kids? Love the post! Love the faces! I heart kiddo! And, I trust him, too! Let me just say that your kiddo was RIGHT ON with this recipe pick. I've made it a number of times, and it's always a hit. Here's a link to mine if you want to take a peek. Allison has been bugging me to make a chocolate cheese cake...(I have no recipe and apparently I don't have the right kind of pan to make a cheesecake!) I think this recipe would be a perfect compromise for the time being!! You're little guy looks SO cute helping you! !...Allison likes to help too---she likes to do brownies all by herself. Now off to check out cookies and cups blog!! 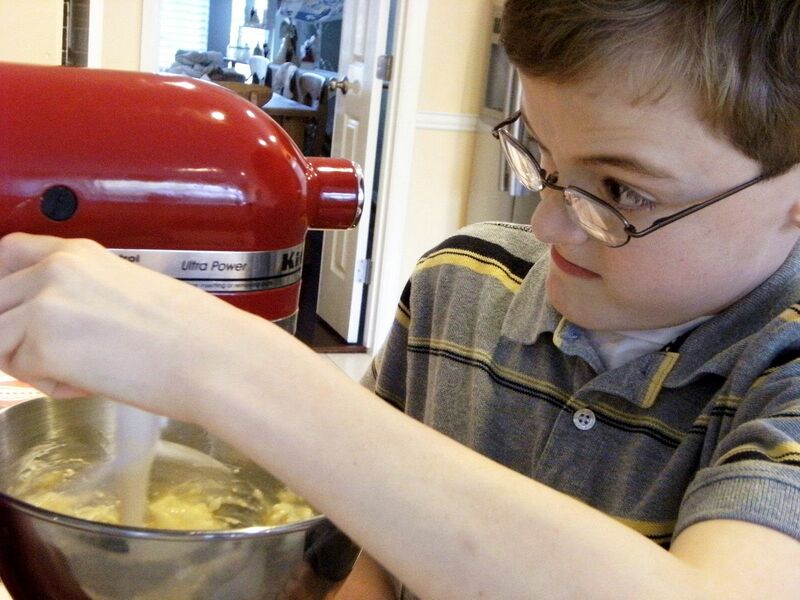 One question: Kiddo learned to trust in the kitchen---but did he learn to SHARE? I love his little head pressed up against the mixer! That is just priceless!! I'm going to love Kiddo in the Kitchen. A wonderful idea Bridget and congratulations to you and your son for a successful kick-off! I love the focus and concentration he shows. Looks like a great time was had together. I'm sure there will be a ton of comments on this post and I hope Kiddo reads them all. He should be very proud of himself. Can't wait for the next addition. Oh My these look good! My kids and I use to make Queen of Heart cookies for Valentines every year! Oh, Dear!! Those look altogether tooooo good. I love seeing BOYS in the kitchen. Hate when people tell me it's not where they belong. Do you want them to starve? Send 'em to the kitchen. Mine are there!! He's a doll Bridget! What a fun idea! My son is always in my kitchen with me too (I'm sure partly because he can still see the tv from there)and loves the power of the Kitchen Aid. Apparently, it's fun to see how high of a speed he can turn it to without having the contents fly out of it. Boys!!! Love em'! great post, Bridget. I love the pictures! how cute! i loved all the expressions on the kiddo's face! priceless! and what a fun way to spend together! 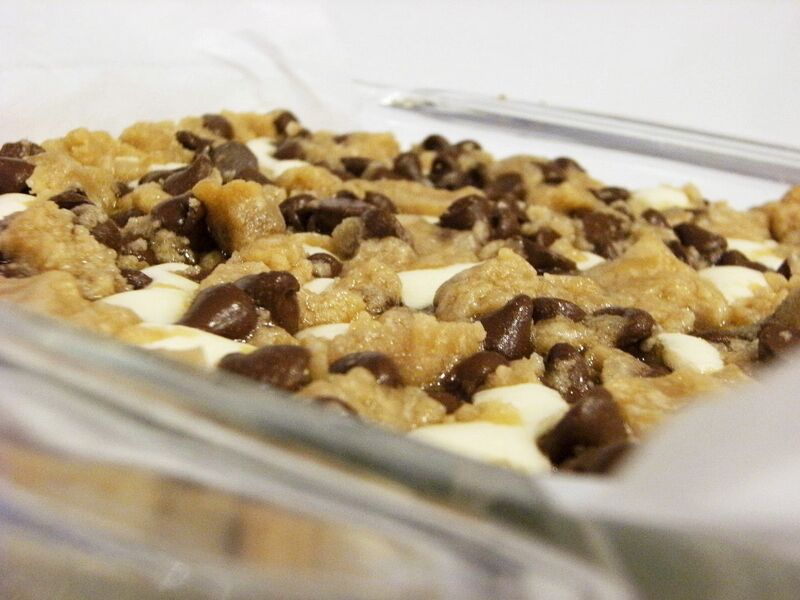 and those cookie bars look pretty tempting too...if they're easy i can do it! LOL! I love this so much! 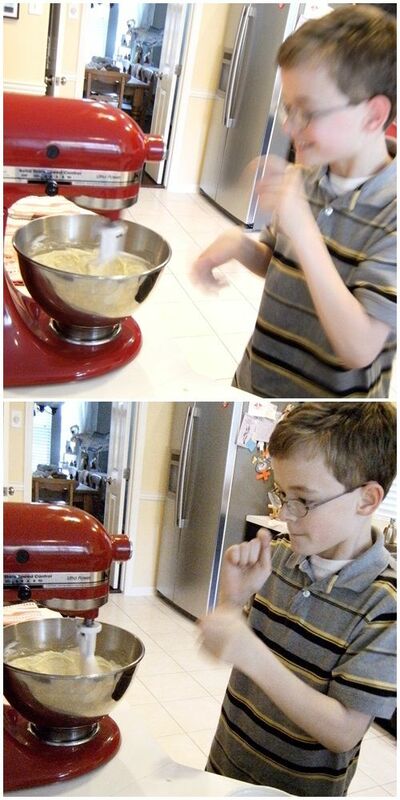 I hope when I have a kid it loves to be in my kitchen baking. And kiddo's got it right--making a face ALWAYS helps! I stick my tongue out when I concentrate on anything...it's all okay until people catch me doing it! My son and I made this recipe a few weeks ago...he loved scooping the cookie dough onto the top the best! P.S. I didn't see a pile of laundry, and even if we did...we are mommies and NEVER judge laundry piles!!! Loved your story. My two daughters often helped in the kitchen; sometimes for fun and as they got older as part of their family responsibility. They did not ALWAYS enjoy it, but as they got older, went to college and now live on their own they are more appreciative of this skill that many of their peers do not have and are envious of! I love the thumbs up at the end. That's a true sign of a winning recipe. Loved seeing the kiddo in action. Such a look of determination on his face while he's in the kitchen. Does he get that from him mom? He looks like a natural. Hope he keeps up the baking and the blogging. Tell him I give him a thumbs up too. Oh my! Cute kid and delicious looking bars! Those look amazing! I will definitely be trying them soon! P.S. love the shirt - Hook'em Horns! What a sweet tradition for the two of you! And he's learning at such a young age - so awesome! It's amazing how so many teens enter my class with probably less baking knowledge than your son has now! Your kiddo is so stinkin' cute! I love the mixer faces ~ that's pretty much how I look when I mix too! Also..when I baked it, the cookie dough spoonfuls sort of looked liked meatballs in the cheesecake, that's why I ended up going heavy on the drizzle...did yours do that? Yum, yum, yum!! :) All those layers of goodness...*divine*! YUmmmmm! Can't wait to try these. I love to bake choc.chip cookies with my kids. We're planning on that tomorrow as well as a Reese's Peanut Butter Cup Cake - we'll see how it goes! Oh my gosh, those look amazing. I am known as the cookie monster here at my house. I never met a cookie, or a sweet I didn't like. I am making those for sure! Your "kiddo" is adorable! And I sure wish my Kitchen Aid was red. I have an old one, and they were only white. BUT...I was in an amazing kitchen store over the weekend, and fell in love with the VIKING mixers!!!!! Oh my!! I MUST HAVE!!!! My 4 y/o little man loves to knead bread dough. Thinking about the recipe and your cutting issue. The crust is interesting to me. I might try it without the graham cracker crust and just use the cookie base as the crust. Just thinking 'out loud' here. These look very tempting - if only I could spare the calories! You son reminds me of mine at that age right down to the cute glasses! Freaking yummmm!! I will have to try those soon. I'm sure my husband will thank you. what a fun post & some great memories are being born!! I LOVE this! Melts my heart. Your son looks like a doll and I bet you two have a great time together. How old is he? Can't wait to see what other things the two of you whip up together. And I MUST try these bars, they look like the type of thing that I would positively devour. Except for the Longhorn t-shirt in the last picture...those bars looked A-MAZING! Those look yummy! Your son is so cute. 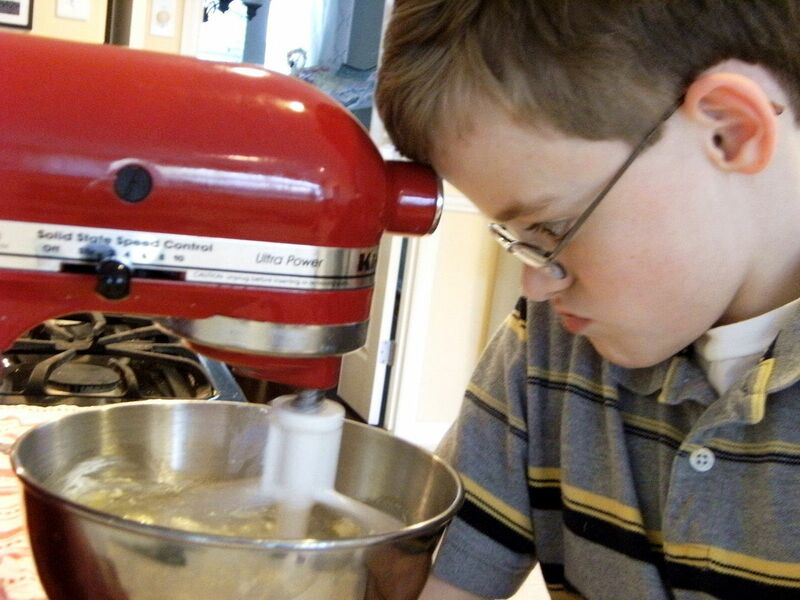 I think it is really great that you are teaching him about baking. I think it is really important for boys to learn too. Oh, yummy, yummy!!! That looks so good and now I'm headed off to that link. OH! I have a birthday party to go to this weekend, these look like a great hostess gift! Kiddo did an excellent job! And I love that face he made at the mixer...shame that whole that is pictures and not video cause he'd win Funniest Home Video's! I loved it when my son played in the kitchen. he always came up with some excellent junk food to eat and drink. Now he's 30 and is the best cook and baker ever! MMmmm, I trust you, C&C, and the kiddo. :) These bars look delish and I love bars. 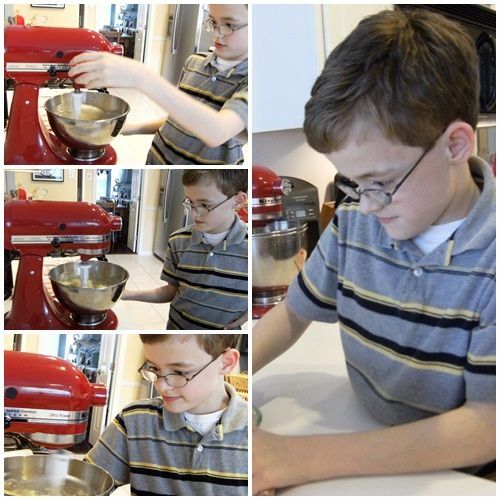 I love to see kids on cooking blogs! I think as parents it's one of the biggest favours we can do for our kids - teach them how to cook. All my kids can cook ( sons and daughters) and I know that they will always be able to make something delicious for themselves or someone they love. I do a similiar post with my son each month - he's only 5 though so his results are .. err somewhat touch and go and he likes as many things as possible to be blue. All my kids are aware of what's good for you and what's not - that's not say say they will always choose the good for you stuff. So, so cute! I am adding that recipe to my "must-try" list! Thanks for sharing! I believe your Dad calls me the Bainbridge Island Girl! That's because I live on an island...called Bainbridge! 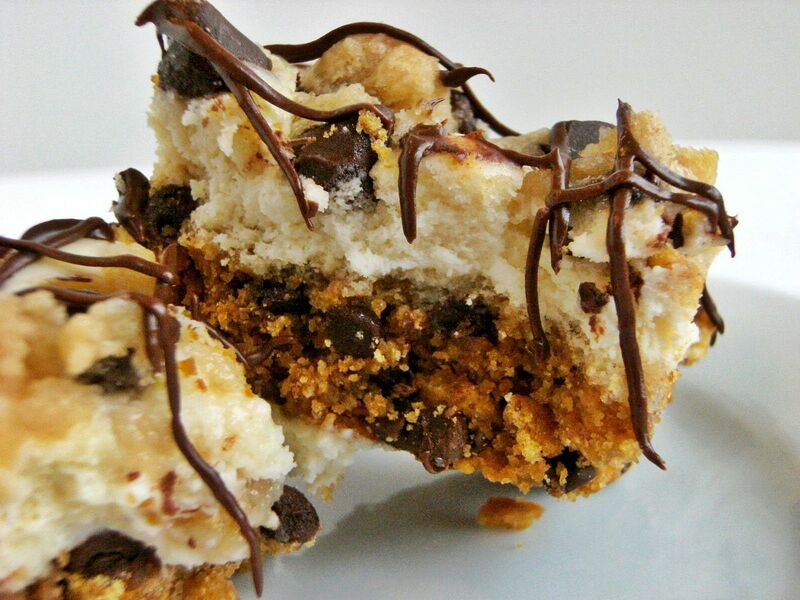 so I don't have a good lookin' guy to whip up some Chocolate Chip Cookie Dough Cheesecake Bars in my kitchen! I have a FUR-BABY...named Doogan...and he would rather be taking walks...he doesn't like me being in the kitchen unless I am frying him an egg and a slice of Canadian Bacon! But I do have a handsome guy like yourself in Alabama who LOVES to cook with his Aunt Tracey! Griffin is in the 7th grade this year! We've been cooking together since he was little! Our favorite thing to cook together is the Thanksgiving Turkey! and he was in Alabama...for the first time...without me there to team up and cook the turkey! Sooooo...I made him a video with all the steps that we always take to cooking the World's Best Turkey! He loved the video and sent me lots of pictures of him prepping and cooking the turkey with my video on the computer by him! Made me realllly miss him! So...I am going to send Griffin this link to Bake at 350 so he can see YOU cooking theses bars and maybe he will want to cook them too! I do know that you and Griffin need some COOL looking aprons...(guy like) to wear if you are going to do lots of cooking! I'll look into that! Lookin forward to allll of your cookin! WHY...oh WHY do you have on that TEXAS LONGHORN tee-shirt????? Give your mom a hug! I could NOT spot the LAUNDRY!!!! mmmm, those looks delicious! What a fun thing to do! Awww so cute! 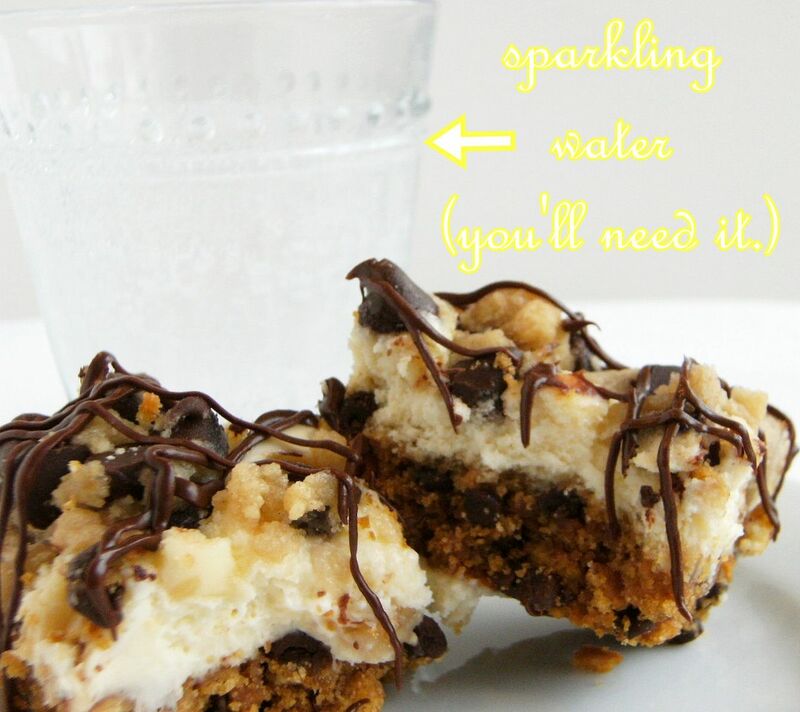 A great post, a great idea and a great recipe! Love, love, love this post. Those bars look amazing, job well done Kiddo! These look SO good!!!!! Two of my favorite desserts! Super cute pics of J~ Love it!! So fun... 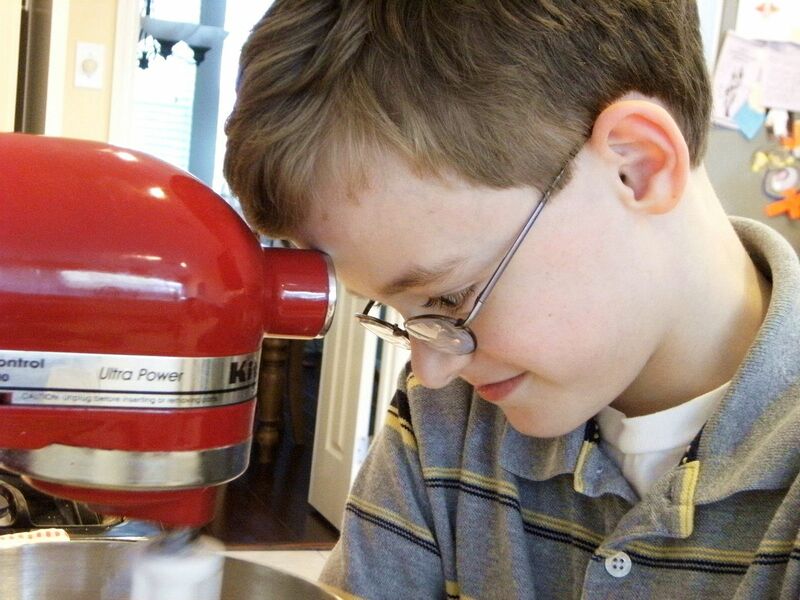 I like the Kiddo and the KitchenAid post idea! I look forward to reading more of them. 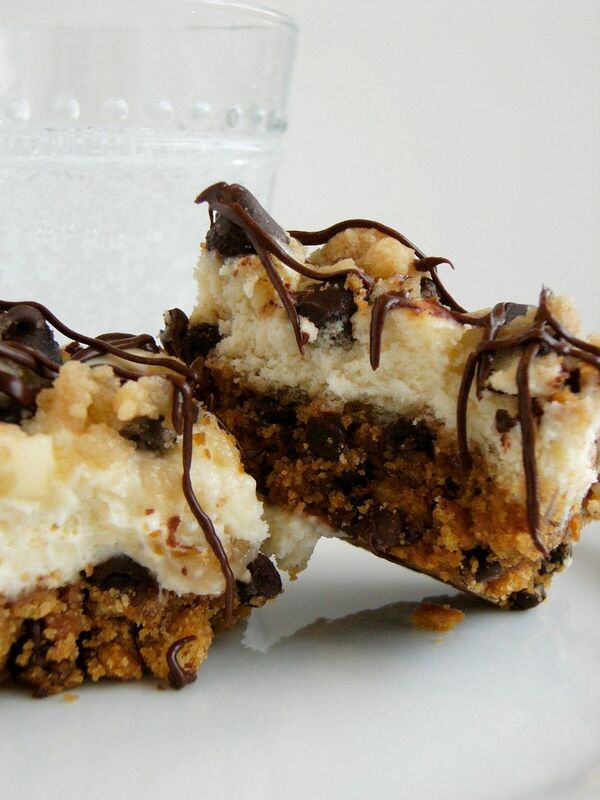 Those are some mighty good looking cheesecake bars, too! This post has totally made my day! His baking/mixing facial expressions are so priceless! This recipe looks super good too! Your son has good taste! I love this new feature and these look SOOO good. 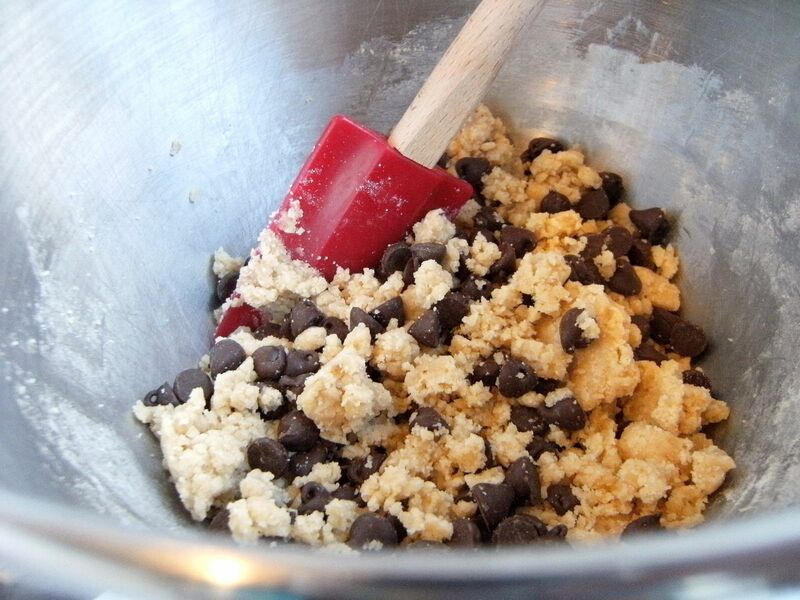 Chocolate chip cookie dough? I'm on it. I've made these and they are AMAZING! yours look great! I LOVE the chocolate drizzle. Looks like it was a success! Your son looks like he's having a lot of fun! He is too cute! I'm glad you have him doing the baking so that you can take a break. The UT shirt is cool!!! Go Longhorns haha. I'm going to bookmark this recipe. It looks fabulous. You and he did an excellent job. I think you may have just made my daughters YEAR. She loves ccc dough and I'm willing to bet she'd try this recipe. Thank You!! Ouch! I hurt my hand on the computer screen trying to take a bite of these. Yum! Love all his cute little faces. Recipe looks yummy...will have to give it a try. I've been trying so many new baked goods recipes lately that our waistlines are beginning to show it. You know you're baking too much when you start running to the store, not for milk and bread, but butter and sugar! Can't wait to try these! A little funny for you...my 7yo daughter was looking at the blog post with me. As I scrolled down, she crinkled up her nose and said "ewwww!" I was appalled! I said "You don't like chocolate chips and cheesecake?" Her response..."No, Mom, not that. That boy has a LONGHORN shirt on. Yuck!" She's such a good little Aggie! These look "hurt me" good! 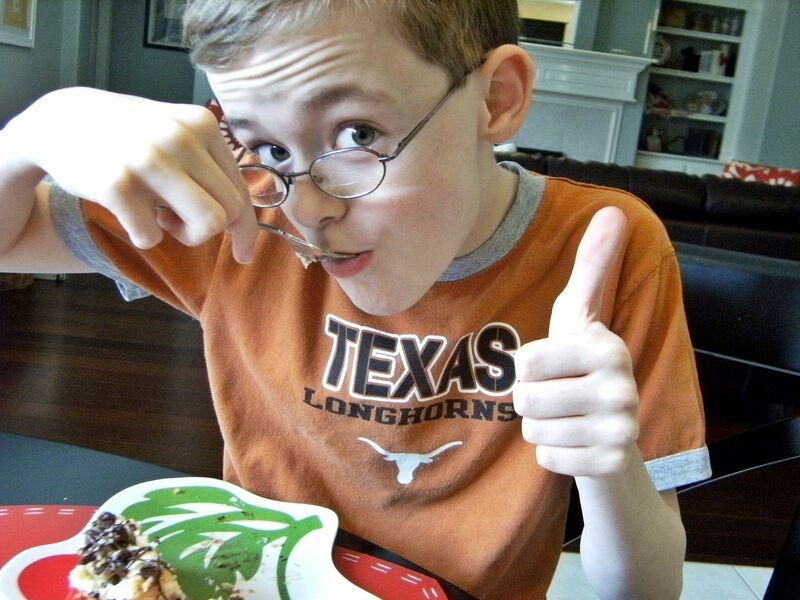 First time to your blog...and I just loved this post, first it is a boy enjoying cooking, and I have five boys who have always joined me in the kitchen and a four year old who won't leave my side now...but then the best was the picture with his TEXAS LONGHORNS SHIRT!!! Go Horns! I am inspired by all the beautiful cookies. Just made these over the weekend - amazing! I doubled the recipe and made it in a 13 x 9" pan. Just in case you ever want to do the same, you don't need to double the chocolate drizzle, 1/3 cup chips was plenty. Thanks for the wonderful recipe - I'll be posting it on my blog soon! Outstanding recipe!! Took them to a bake sale and as soon as the first one was sold and tasted and word got out, the rest vanished within FIVE MINUTES!!! Tip: To get nice squares, cut the bars in the pan with a bench scraper. These are simply divine, I'm sure of it without even having a bite. My apologies if someone has already mentioned this but I make easy slices using a pizza cutter. I swear by that tool.